GNU gettext is a C library which lets you add translation support to your program with fallbacks to original text if no translation is available. See http://stackoverflow.com/questions/1003360/complete-c-i18n-gettext-hello-world-example for a hello world example using gettext. See http://www.gnu.org/software/libc/manual/html_node/Locating-gettext-catalog.html for selecting translation file in code. See http://www.gnu.org/software/libc/manual/html_node/Translation-with-gettext.html for using gettext in code. See http://www.gnu.org/software/gettext/manual/html_node/lib_002fgettext_002eh.html for using gettext.h instead of libintl.h to get extended capabilities such as pgettext (adds context) and support for replacing gettext commmands with no-op if gettext is not installed on system. See http://www.gnu.org/software/gettext/manual/html_node/PO-Files.html for how PO files work (text files translations). See http://www.heiner-eichmann.de/autotools/using_gettext.html, http://www.gnu.org/software/gettext/FAQ.html, and http://www.gnu.org/savannah-checkouts/gnu/gettext/manual/html_node/xgettext-Invocation.html for some information on using xgettext to extract strings for translation into a POT file. See http://www.gnu.org/software/gettext/manual/html_node/msginit-Invocation.html on how msginit generates language specific translation files (PO) from POT file. See http://www.gnu.org/software/gettext/manual/html_node/msgmerge-Invocation.html on how msgmerge generates updated language specific translation files (PO) from a changed POT file. See http://www.gnu.org/software/gettext/manual/html_node/msgfmt-Invocation.html on how msgfmt generates binary translation files (MO) from human readable translation files (PO). Copy gettext.h from /usr/share/gettext/ to your component or project. Include gettext.h in your cpp file. use msgfmt to generate new mygt.mo file from mygt_norwegian.po_new. // Note: abstract still needs a ui-view for its children to populate. // You can simply add it inline here. This resultet in a blank page (although the controller was executed since it fetched the model from my backend). Also my navigation, for which I used $ionicHistory, was all messed up. One feature that Android has adopted is 9-patch images. 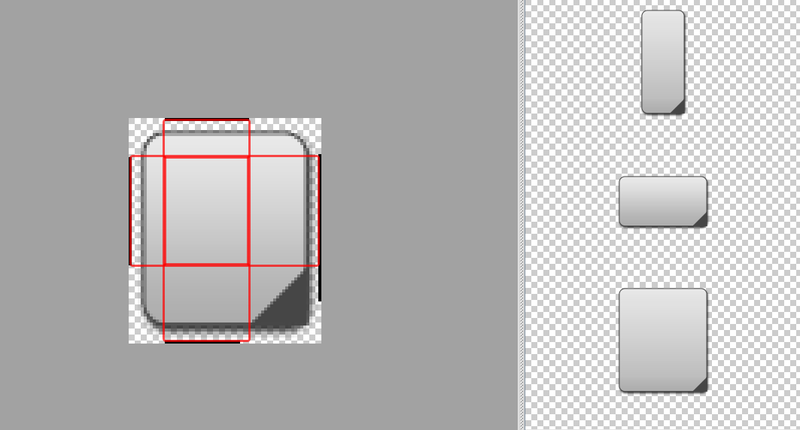 The Android Studio contains a Draw 9-patch tool which lets you 'create bitmap images that automatically resize'. Basically you select areas of an image that can be repeated or stretched while others are kept at the same size. Giving you almost SVG functionality for bitmap images, especially great for buttons. Now this feature would be great for web as well, e.g. responsive design pages. To achieve this we can use the CSS3 feature border-image which combines border-image-source, border-image-width, border-image-slice and border-image-outset. border-image-source defines which image to use. border-image-width defines the width of the border image. Stretches or shrinks the image regions to fit the widths. border-image-slice divides the image into 9 regions, thereby the name (see the image above) deciding which parts can be repeated/stretched. The regions are: four corners, four edges and a middle. The fill property decides if the middle should be filled in or kept transparent. border-image combines the four above properties, but I felt I had more control when splitting them up. However, as of right now browser support for border-image and especially border-image-outset is a bit limited. Most browsers support border-image, but might need browser-specific CSS (e.g. -webkit-border-image). http://border-image.com lets you generate border-image CSS from an image. but it doesn't put in border-image-outset. "org.mockito" % "mockito-all" % "1.10.19"
Note the static import of Mockito. This lets you call mock and when without "Mockito." prefix, like most of the tutorials do. 5. Run using play test, you might want to run play clean first to make sure mockito is downloaded.